Hey kids! I just watched a great movie. 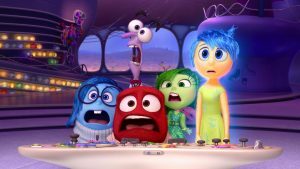 Have you seen Inside Out yet? If not, you should talk to your parents about having a movie night! Have you ever heard a story that helped you understand yourself better? That’s what Inside Out did for me. The movie is all about a girl named Riley and the way that her emotions work. Her feelings and actions are controlled by five basic emotions: Joy, Sadness, Fear, Disgust, and Anger. The thing that makes the movie really fun to watch is that each emotion is personified – that means that each of her emotions is made into a person. For example, Anger is a short, red man with fire as hair, and Sadness is a soft-spoken girl who cries easily. As Riley goes through her everyday life, we get to see how each of her emotions responds to things that happen. As Riley grows up, the big, influential events in her life are turned into Core Memories. Like Riley, we’re always creating new memories, but Core Memories are significant because we attach strong emotions – good or bad – to them. Core Memories have a lasting impact on our lives and affect the way we interact with the world around us. I don’t want to give anything away, but Riley’s emotions start to go crazy when a big change happens in her life. When her Core Memories become compromised, Riley’s emotions have to work together to help her make good decisions and adapt to her changing life. What things make you feel Joy? Sadness? Fear? Disgust? Anger? What are some times that you really didn’t know what emotion you were feeling? What are some times where feeling sad, fearful, disgusted, or angry were good things? Even if they felt bad, how did they help you? What are some of your Core Memories, and why are they so important to you? I hope you enjoy the movie – it’s one of my favorites!